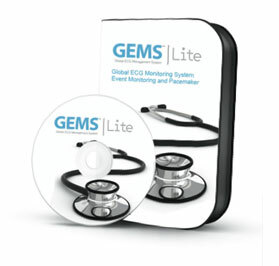 GEMS™ Lite Global ECG Management System) is a cost effective alternative to using expensive and outdated hardware receiving systems and can be installed on most existing desktop computers (refer to minimum PC requirements). The focus of GEMS™ Lite is to manage your information from a patient centered point of view. The software captures transmitted ECG data and stores it in a simple to use database along with the associated patient information. This is the easiest way to receive and electronically store ECG's and patient information on the market today. GEMS™ Lite is a single user, stand-alone MS Access based application that allows for future expansion into the higher-end GEMSTM suite of Arrhythmia and Pacemaker/ICD management products. GEMS™ Lite is a very affordable alternative to expensive and outdated hardware receiving systems, yet it allows you to easily expand into our higher-end GEMSTM suite of products including enhanced Event Monitoring and Pacemaker / ICD Follow-up. ™Lite is designed to speed up and simplify basic information gathering and reporting for Arrhythmia monitoring and TTM Pacing patients. All patient and physician information is stored locally and is displayed in a format that is both easy to view and use, even for novice computer users. GEMS™ Lite gives you three basic reporting options and each report can be saved, stored and viewed in either Adobe Acrobat (PDF) or Word (RTF) format. ECG's are classified into two types, Arrhythmia / Arrhythmia 12-Lead and TTM Pacing. GEMS™ Lite has the ability to automatically split out ECGs into individual events (device dependent) and allow editing of each individual event. Scheduler Lite™ is a tool for managing schedules for Arrhythmia and TTM follow-ups. Scheduler Lite is equivalent to a traditional appointment ledger. You get the familiar look and feel of an appointment book with the convenient features of a centralized database for managing all your patient appointments. GEMS Lite is now Windows 7 compatible. • GEMS Lite is now Windows 7 compatible.